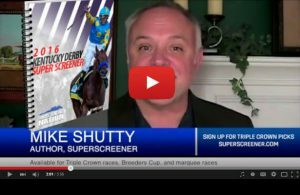 Home / Kentucky Derby 2016 / Top Super Screener Choices SCORE on Kentucky Derby 2016! 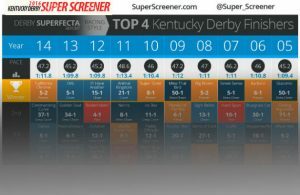 Top Super Screener Choices SCORE on Kentucky Derby 2016! The 142nd renewal of the Kentucky Derby is now in the history books and last year’s 2 year-old champ, Nyquist, remains undefeated in 8 starts, putting on a performance, indeed, fit of a champion – holding off a late charging Exaggerator who has come close but has never defeated Nyquist in 4 previous starts. This sets up for an exciting and intriguing rematch in the Preakness Stakes just two weeks from today. Once again, California-based horses completed the Exacta as they did last year and their superior quality was anticipated by the Super Screener. Gun Runner ran a gutsy third prevailing over Mohaymen, and the late charging Suddenbreakingnews after chasing a pretty swift but unpressured pace that was :45+ and 1:10+ and validating that his success in Louisiana was no fluke. Nyquist spanked Mohaymen quite soundly in the Florida Derby, but the latter foe rebounded nicely to finish a good 4th , thereby, confirming that his success this Spring is likely to continue. Shagaf was pulled up and there was trouble with Whitmore and we are awaiting reports on both. Top Super Screener longshots Destin and Mo Tom finished in the top 10 but as was anticipated, the glib Churchill Downs surface and a pace that was honest but not pressured put a damper on the moves of all deep closers. Exaggerator worked out a great trip from far back and look like the best horse coming down the stretch. The Super Screener hit on a bunch of Trifecta tickets and a couple of Exacta’s. Like last year and, very uncharacteristic of the Kentucky Derby, the payoffs came back super chalky with the top four finishers also accounting for the exact order of the odds. If you were disappointed with the payoffs, join the club…not your typical 20-horse Derby payoffs by any means and none this low in over 30 years. Our Super Screener goal is to produce an insightful analysis of the race and a thorough analysis of each horse as they rate against our Super Screener criteria. In addition, we provide wagering recommendations targeted to produce maximum payoffs as the Kentucky Derby typically offers one of the greatest payoff opportunities of any race. With 20 horse fields now the norm, the current chalky trend is very likely to be temporary. 1. The top 3 finishers from the race came from our Super Screener top 4 rated horses. 2. The top 4 finishers were successfully tabbed as members of this year’s Super Screener Super 7. 3. Nyquist was one of our top win contenders and 2nd place finisher Exaggerator was the highest scoring Super Screener horse that was also our top board hitter being the #1 choice within our B-rated horses. Gun Runner, a top Super Screener win contender finished 3rd . 4. The Super Screener correctly projected California-based horses to once again dominate in this year’s Super Screener. 5. All “Toss” horses finished back in the pack and top long shot horses, Destin and Mo Tom finished 6th and 8th , respectively, defeating all but one of the 11 other 20-1+ long shots. The 2016 Kentucky Derby is now in the books and it is no rest for the weary as we get started on the Preakness Stakes Super Screener, in which we hope to see many of the Kentucky Derby participants return to do battle along with some interesting new shooters. As always, we are very grateful to you our Super Screener buyers and we look forward to guiding you to victory in the Preakness and Belmont Stakes. 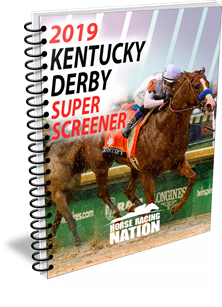 Hit The 2016 Kentucky Derby Superfecta! 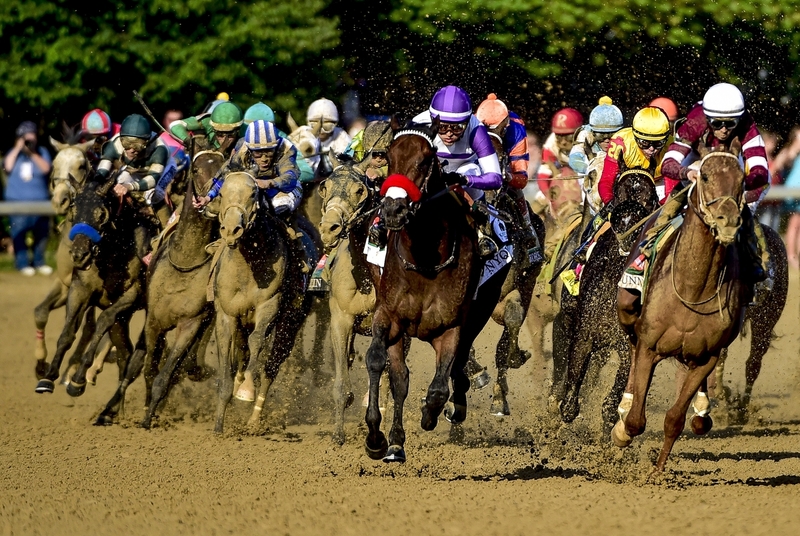 [VIDEO] Three Killer Tips to WIN The Kentucky Derby! Kentucky Derby 2018 – Who are the Best Three Longshots?